Looking for inspiration to start creating more freely in your life and business? Buy this book featuring yours truly! Finding the one thing in life that you would do no matter what, is the key to having joy in business. For me, art was that special thing. When I started painting daily, the creative flow I felt began to influence my other businesses, and very soon my art became an actual business of its own. I am living proof of the way creation can change your life and entire notion of business altogether. That’s also the topic of the opening chapter – my chapter – in the Amazon bestseller “Creating Business Beyond This Reality”. I did it my way. What’s yours? 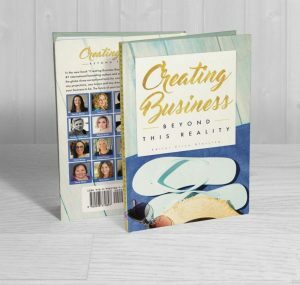 “Creating Business Beyond This Reality” takes you on a journey into what may be possible that you have never even considered. The authors of this book are all successful entrepreneurs that share tools and practices designed to rocket-launch your creations and take your business to the next level. Katarina Nilsson, Tina Devine, Kass Thomas, Georgia Watson, Peggy Sue Honeyman-Scott, Jennifer Cramer Lewis, Melanie Meade, Rebecca Hulse, Jennilynne Coley, Natalie Krishna, Donna Martuge, Kristen Trimmer, Barbara Schubert, Benoit Trudel, Beth Segaloff, Wendy Dillard, Becca Speert, Kali Lane, Andora Freedom, Megan Sillito and Erica Glessing.